While I've been knitting tons, I don't really have a lot to show for it. Juno and Brioche look exactly like they did last time, more or less. I did finish my mom's hat. Here it is, modeled by yours truly. Yarn: Cascade 220 Superwash Paints, colorway (creatively named) 9877. The pattern is the "Most Basic Hat" from Hip to Knit. I did make a tactical error, though. I washed the hat--it really needed a soaking to even up the decreases--but forgot the fickle nature of superwash. Damp, it was HUGE (and incredibly limp, stupid superwash). I baked the sucker in the dryer and it went back to normal size. Note to self: pre-wash wool and go down a needle size next time. I'm also working on another pair of toe-up socks (still in Regia--I know a good thing when I knit it). 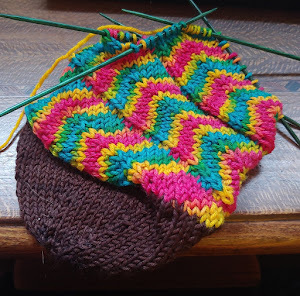 At the request of Aspen, I'm perfecting the pattern, which is designed to be the most mindless and easy pair of socks in the world. Once said pattern is done, I will release it to the general populace. Next time, maybe some pictures of what I got over break . . . or maybe cute pictures of puppies . . . you'll just have to wait to see. So that's what's going on? What are you knitting, crafting, reading, or otherwise engaged in? The toe-up Regia socks are finally complete! Yarn: Regia Silk 55/25/20 merino/polyamide/silk, colorway Nairobi. Pattern: my own, cobbled together from a variety of sources. I used the cast on from Sandy Cushman’s Up-Down Spiral Sox fromFavorite Socks. I then made a lot more increases and knit a plain foot for about 50 rows. I borrowed Wendy Johnson’s short row heel from her Generic Toe-Up Sock pattern. Then I knitted even for another 45 rows or so, knit 15 rows of 2x2 rib, and finished with a lace bind-off. Yarn: Society Socks, colorway #218, "Caribbean." Pattern: Merino Lace Socks from Favorite Socks. I shortened the heel flap and picked up fewer stitches for the gussets, but I think they might still be a little big for my mom. Oh well, she'll like them anyway. It's really hard to take pictures of your own feet! First, laceweight from my favorite dealer source, Posh Yarn. The purple is Arabella (70/30 merino/cashmere) in "Karma" and the black is Cecilia (50/50 silk/cashmere) in "Onyx." This laceweight I got at my LYS. It's J. Knits "Lace-a-licious" (100% alpaca) in the colorway "New York" (so of course I couldn't resist). This is some more alpaca, in a slightly heavier weight. I think these lovely things are destined to be a hat and scarf for yours truly. Last but not least, my birthday present from K was a membership in this year's Rockin' Sock Club. I don't yet know if I'll use the club pattern, but it's an awful pretty yarn . . . I'm back! Things in my personal life are better--or at least good enough that I can do some serious knitting. So, without further ado . . .
First, this is a hat for my mother, to replace one I made long ago that got lost. Yarn is good old Cascade 220, pattern is the "Most Basic Hat" from Hip to Knit. Incidentally, this is the very first knitting book I ever bought, and it's served me well. Some of the more "fashionable" stuff is a bit out-dated now--remember those open sweater coats from about eight years ago?-- but the basics are solid. I knit my first hat, socks, and sweater all from this book. Third, I've started Juno Regina. It's a great pattern and a lovely yarn, but oy . . . this part where you knit the same thing for 42 inches straight--it wears on a girl. Here you see it looking kind of crappy, the way lace always does pre-blocking.